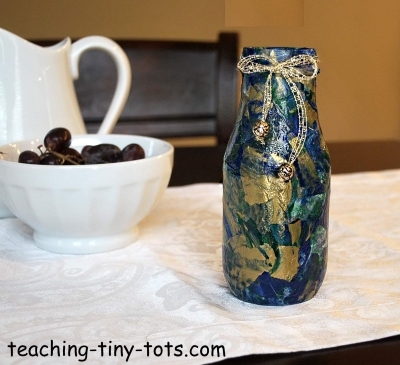 Try this variation on Decoupage...using paint, create a unique marbling effect. You can decorate anything you would normally decoupage jars, vases, wooden trinket boxes. Empty jar, bottle (Snapple, Iced Coffee). Wash and dry removing all labels. Tissue Paper One large sheet (20" x 25") or two small sheets. Waxed Paper and newspaper to work on. Mod Podge Gloss-Lustre Non Toxic Water Based Sealer, glue and finish. This is Decoupage glue. Lay out newspaper on flat surface. Place waxed paper on top of newspaper. Lay one sheet of tissue on the waxed paper. Drizzle paint on tissue paper. Using paint scraper, small piece of cardboard or other flat smooth item, spread the paint evenly onto the tissue paper. Let colors blend together but don't over do it or the colors will become colors muddy. If you want more gold or a certain color in an area...put a couple drops where you want it and spread gently. Let dry overnight and gently peel off waxed paper. Newspaper will stick so make sure most of surface is covered by waxed paper. Tear into 2" inch pieces or a little larger if it is a large bottle or vase. Pour ModPodge or other decoupage glue into small dish. Using brush, apply generously onto small area on the glass jar. Press tissue piece onto the jar. Brush ModPodge over piece. Repeat until entire bottle or vase is covered overlapping pieces as you go. Apply two coats of Mod Podge on top of tissue letting each coat dry before applying the second. Embellish with a ribbon, beads, gift card or by adding flowers to vase. Goo Gone works well if there is sticky residue left from label on jars. We used the back of children's paint scrapers to spread the paint. Explain how to spread the paint gently so as not to tear the paper. Practice on a piece of tissue. Find colors that will complement the room it will be in. Using a metallic color like gold or silver really adds to the finished product. Above we used blue, gold and green. Have children wear smocks or t-shirts as acrylic when dried is permanent. Delta Ceramcoat is washable when wet. Costco sells large sheets of tissue during Christmas at a very inexpensive price. You can also find sheets at the Dollar Tree. Cover small trays, bowls. Find some neat vases at garage sales, or vintage shops. 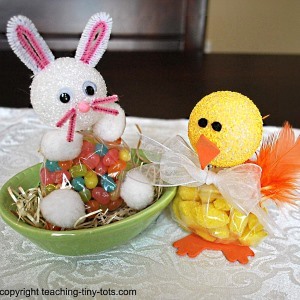 Since the paint eliminates the sheerness of the tissue you could use items made from plastic which may be preferable as a young toddler activity. 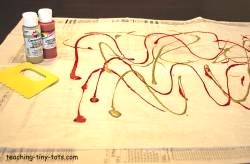 To simplify this toddler activity, tear colored or patterned tissue into small squares and glue on as described. This was a project that I used in my classroom for a Mother's Day gift. We did this blue and gold vase with my four year olds.